It’s a rare rainy Wednesday afternoon, in Weligama, the type you may look for an extra layer, like a jumper? Yes, even in Sri Lanka we may need a bit of a cover up sometimes. 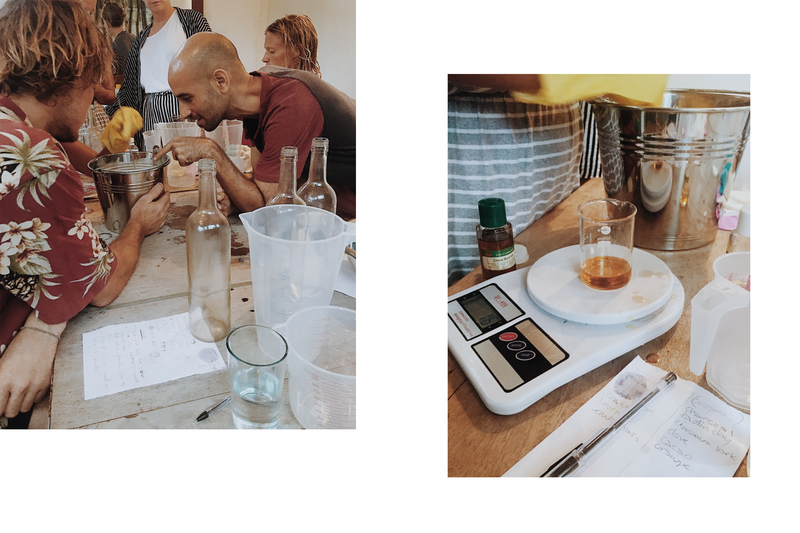 On this particular evening, we host our first workshop with our dear friends Moonshadow in our cafe. 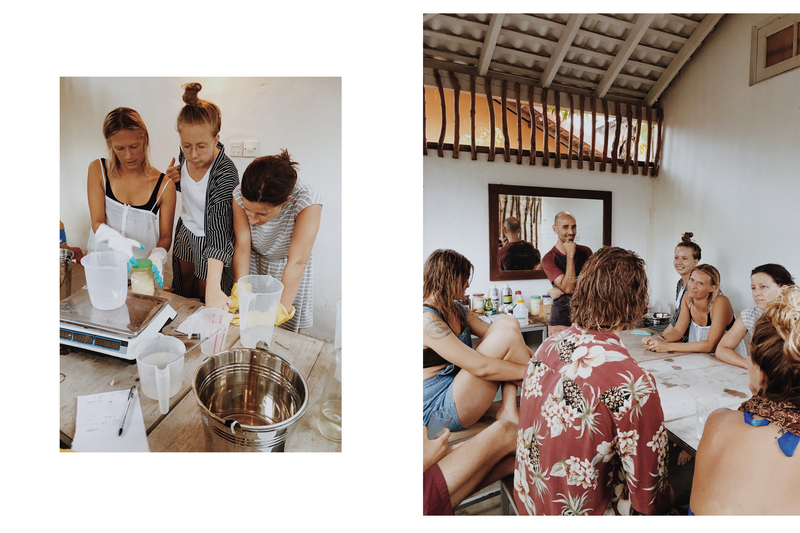 The workshop sees ten beautiful people gather together in Ceylon Sliders, eagerly waiting to learn how to make Moonshadow soap bars. Already you can sense the creative vibes around the table. 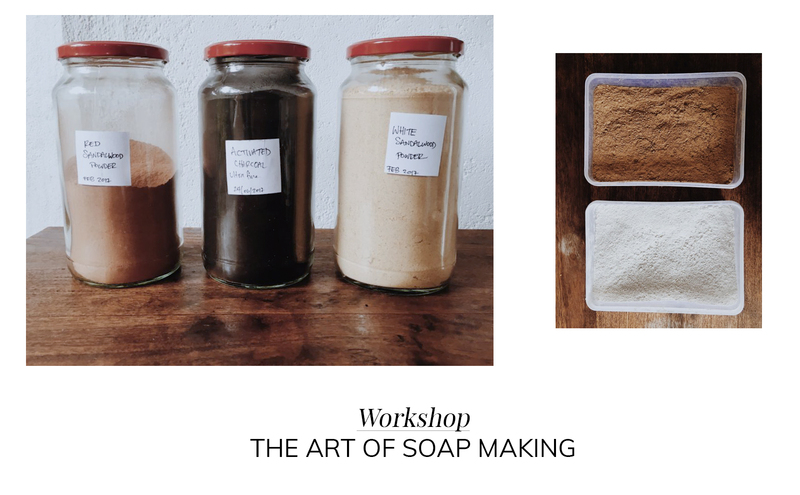 Sion opens up the class with a short intro with everyone and without any delay he begins to share his experience & knowledge about his company, his learnings with soap making over the past 4 years, and using and sourcing natural ingredients. It’s time to become chemists for the first half of the class. Gloves at the ready we spilt into groups of 3 and 4 and start to make the soap base. Weighing out oils, calculating clear measurements instructed by Sion there is no room for error we are told. ( No pressure than). Listening to his clear guidelines and following his steps we begin to make soap. Flashback to chemistry class but much more fun! The second half of the workshop, we become artists. Adding in colour, shades, texture and a whole lot of passion into these soap bars. 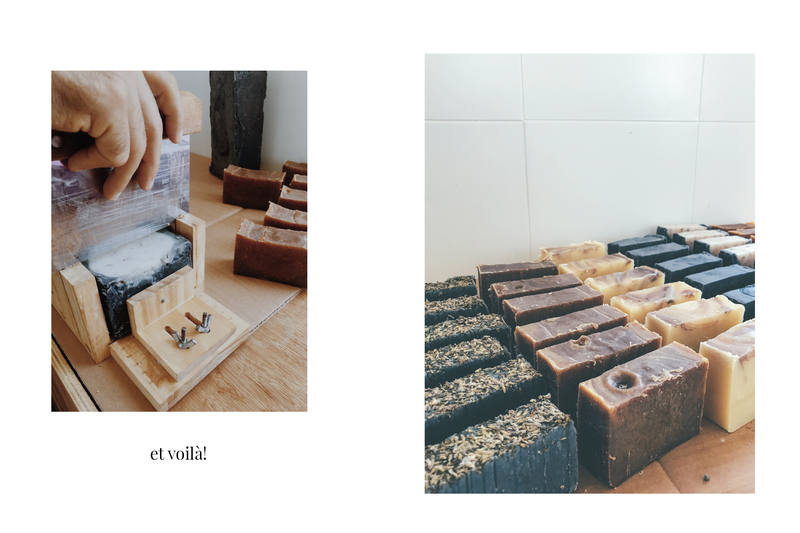 Each group makes two loafs of soap, collectively, we create the type of soap we all want to take home with us. Fortunately, we all surf most days in Weligama at the Island, so have built up a nice upper body arm strength to help with all the muscle work required to make soap. Who knew ?! We stirred, mixed and blended for over an hour, each taking it in turns. It was hard, but consistency and good team work paid off. The second half of the workshop, we become artists. Adding in colour, shades, texture and a whole lot of passion into these soap bars. 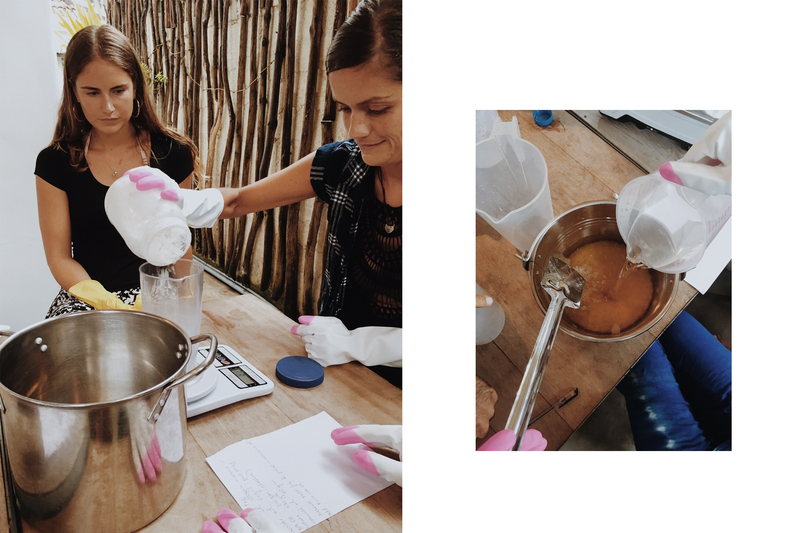 Each group makes two loafs of soap, collectively we create the type of soap we all want to take home with us. 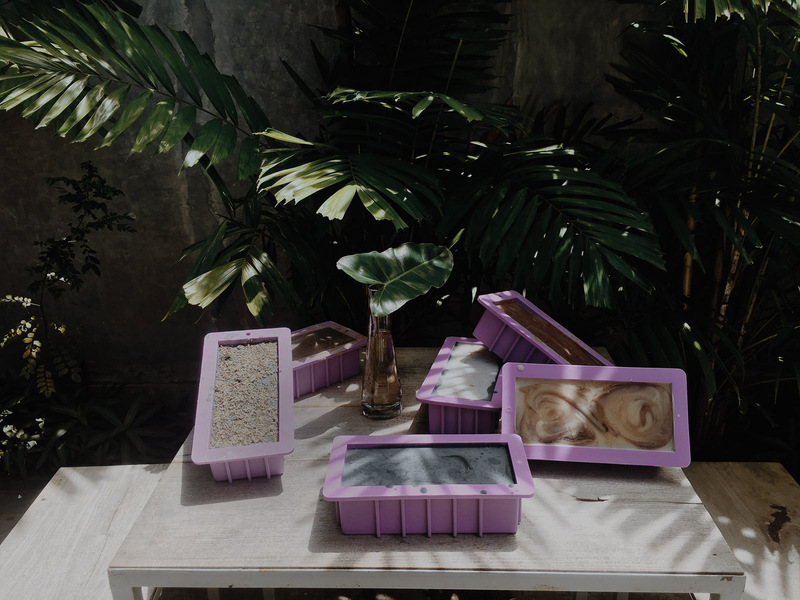 Charcoal, white and red sandalwood, cinnamon, clove, peppermint, turmeric, lavender become popular choices when selecting scents and powders to colour our soap bars and make them smell heavenly …. the aromas coming from Ceylon Sliders this evening is forever memorable. Simply delicious. 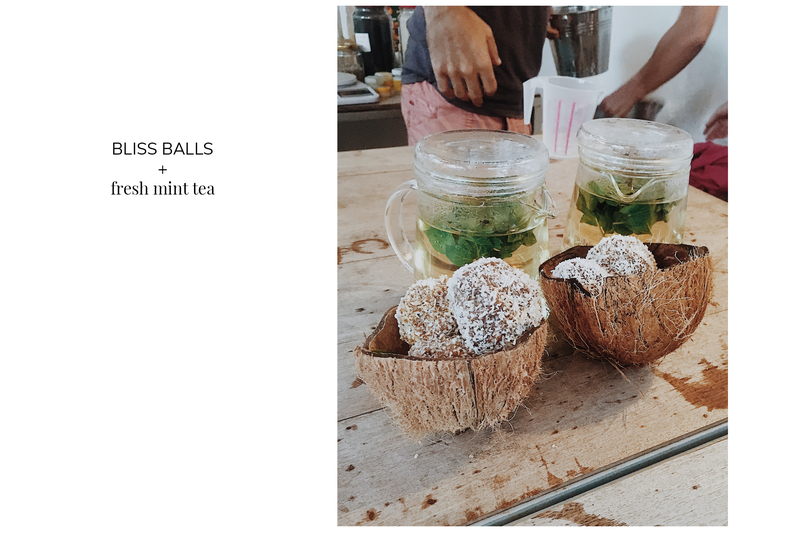 Science and art aside, now to enjoy some home made bliss balls and fresh organic peppermint tea. The perfect combination after an all hands on workshop with Moonshadow. The soap needs to set for at least 24 hours, so we leave the soap loafs over night to become harder. Sion explains the longer we leave the soap to set the better it will be, as it locks in all the oils for longer. The next morning, we carefully cut the fresh soap bars. There is something very satisfying when you see the end result of your own work, and know every step was crafted by hand. 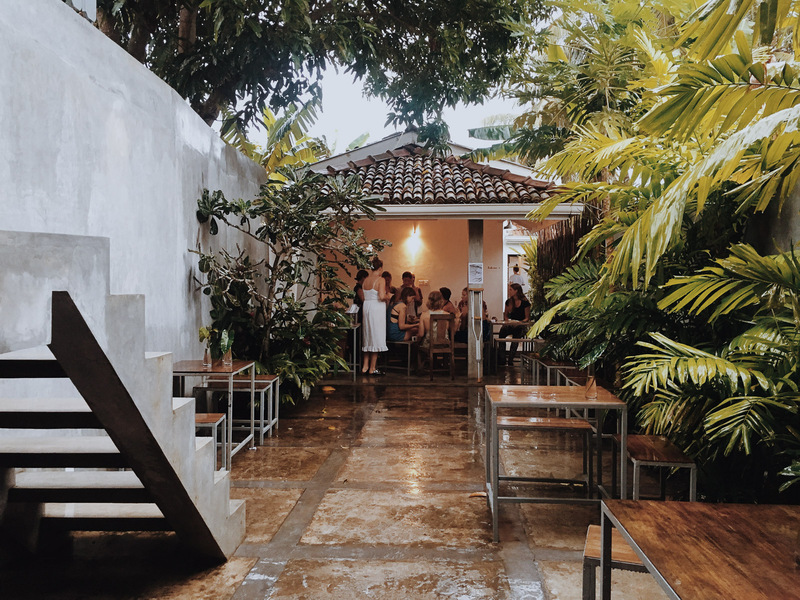 Thank you to the team at Ceylon Sliders for being the perfect hosts, to Samia Thulin who captured the special event on her camera and a big thank you to Sion from Moonshadow who has inspired. Stay tuned for the next Ceylon Sliders workshop, we hope to see you there.